USA/Canada, but supported and widely used in Latin America. In February 2011, I sent vulnerability information about command execution on D-Link DIR-600 to D-Link Chile, then to D-Link Latin America but after sending many e-mails I haven't got any response. 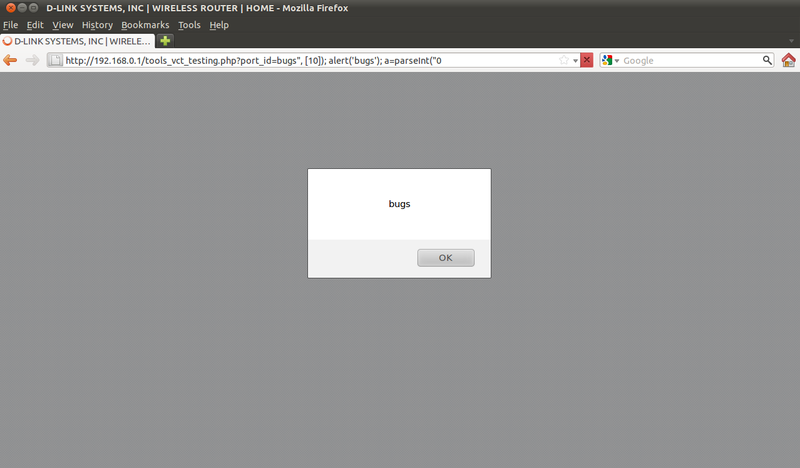 A common XSS was found in DIR-600 web interface. It's a video about the vulnerability and its exploitation. Currently, all firmware versions are vulnerable (2.05, 2.0). This vulnerability requires administrator privileges, but the default firmware version (2.0) is vulnerable to HNAP flaw too, discovered by SourceSec Security Research. A combination of these two vulnerabilities turns out a remote code execution exploit without the need of valid authentication credentials. with busybox and so on).